Ski tourers are already a slightly different breed from our inbounds cousins, many of whom regard us as unhinged: “Ski up the mountain? You must have dismal understanding of gravity,” they say. While there are certainly a range of reasons for why people ski uphill (exercise, access to fresh lines/snow, sense of accomplishment, not wanting to pay a week’s paycheck for a lift ticket, etc. ), I think that for many of us it might boil down in some way to the enjoyment of nature. Why do I ski tour? I can witness a weasel running over and under the snow like a sewing needle, see where the fox stuck his head in the snow, and I can listen to the muted silence of an old growth forest under a blanket of snow. Then I can blast through that powder on the way down, my legs and body eagerly inhaling the vertical they gained a short time ago. Also all that work skiing up the mountain helps build up a healthy appetite. I led a fly-fishing trip to Swedish Lapland this summer, and I was reminded of Swedes’ love of the outdoors. It is part of their national identity. Swedes love spending time outside (especially when the sun is out), but they also dress appropriately for a wide range of temperatures. They treat eating outside as a time to be savored and enjoyed, not an event to simply refuel the body. This often translates into building a fire, cooking sausages or other meat on sticks (or whole fish plucked from the lake or river), devouring slabs of hard cheese on rye bread slathered with butter and maybe a cucumber, and of course boiling coffee (kokkaffe) and noshing pastries. Benches are carved from the snow, down jackets donned, foam pads or reindeer hides are spread out, and time is taken to stop and enjoy the act of eating and being outside. When my wife and I first moved to Sweden my wife exclaimed “now I see why some people say we are related to flowers,” in reference to gaggles of Swedes sitting in outdoor cafes, in sub freezing weather with their faces all aimed at the sun. I am not sure what research she was referencing regarding people as flowers, but I saw her point. So what foods can you bring ski touring that remain real food, but are not difficult to transport or prepare? My ideal victuals depend on where I am. If I could choose anything I would bring the excellent cheeses, charcuterie (cured meats such as jambon cru, the French version of prosciutto), ham, saucisson sec (salami), viande seché (air dried beef), crusty bread, and chocolate that can be found in France, Switzerland, Italy, Germany, Austria, and Spain for little money and with great ease. If the weather is going to be bad then a sandwich is certainly the easiest way to go, but I prefer to bring everything as components and eat as if it was a cheese and charcuterie board, nibbling on a bit of cheese and bread, then taking a bit of prosciutto, and carrying on like that. A crusty bread, a couple of hunks of cheese, some dried sausages, and you are set! If you are eating outside like this in France, someone will invariably ski by you and yell a cheery “Bon Appétit! Photo by Aaron Schorsch. I also love to try new things and am often tempted by a slab of rabbit pate’ or a thick slice of almond nougat. If I am doing an overnight trip, or a trip with friends where food plays a central role, then cooking meat (sausages are great) or hearty cheese dishes make for a memorable meal. Also depending on how cold it is where you ski tour, I strongly recommend bringing ice cream. Remember up until the invention of freezers in the 1850s most ice-cream or similar treats were likely only enjoyed during the winter. 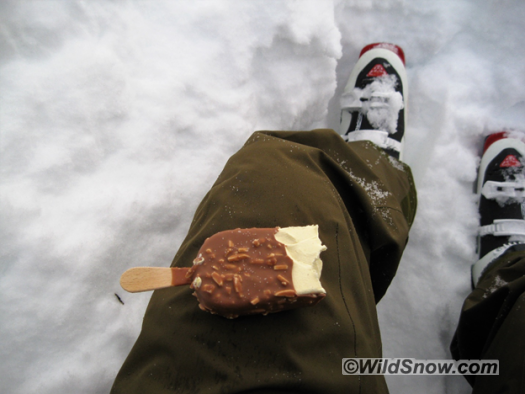 The great thing about ski touring with ice cream is that you can eat it at very leisurely pace (I often stick my chocolate and almond ice cream bar in the snow between laps — the tasty reward awaits, inspiring yet another go). Yes I am a bit crazy for bringing ice cream while touring, but it just makes sense! Photo by Aaron Schorsch. 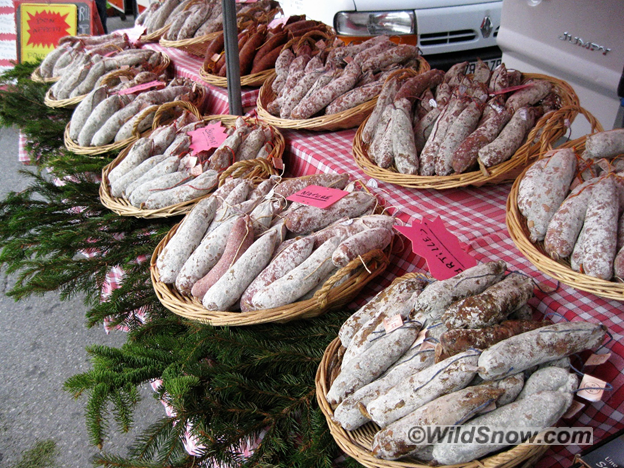 You can’t go anywhere in France without running into “saucisson sec,” a delicious and satisfying fuel for ski touring. Photo by Aaron Schorsch. Almond paste-a mixture of almonds and sugar, almond paste is high energy, not messy, easy to handle and store, doesn’t freeze or melt, and is delicious. Add a bite of a dark chocolate bar and you have one tasty treat! “Marzipan” is similar, though almond paste generally has a higher percentage of almonds to sugar (around 50-50). Beef Jerky-Great source of protein and sodium. If you are a diehard lightweight tourer this is a great way to go. Saucisson sec (or salami)-Similar to the benefits of jerky but also has a good amount of fat which is important in cold weather with high energy output. Weighs more than jerky but I think it tastes better and you can use it to grease chapped lips in a pinch (gross!). Dried fruit and nuts (good old peanuts and raisins)-I like making my own mixture of nuts, dried fruit, chocolate, and other bulk bin treats (if there is Trader Joe’s near you they have a great selection of nuts). This is quick and easy to eat and provides lots of good energy. Hot drinks-Perhaps you don’t want to tarry as much as Swedes and go through the process of making a fire in the snow but having a thermos of something hot is a great way to keep your body temperature up and have something to look forward to. Tea, rich hot chocolate, or coffee all the do trick. Just remember to preheat your thermos. A few cookies (or cardamom rolls if you are Swedish) are a good accompaniment. Take a seat on reindeer hide (or mat) and enjoy some Kaffe! Photo by Aaron Schorsch. 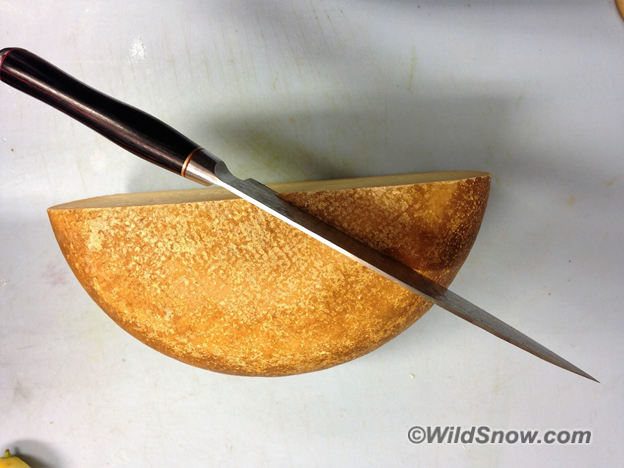 Raclette- This is a cheese based dish that originates from the French and Swiss Alps. Cow herders would place a large slab, or even a half-wheel of cheese, next to the fire and when the outside edge became hot and bubbly they would scrape (“racle” in French) the cheese onto bread or boiled potatoes. This dish is usually served with charcuterie (cured meats such as Prosciutto, salami, ham, coppa, etc) as well as cornichons (tarragon mini-pickles), pickled baby onions, and lots of white wine. You can recreate raclette in several ways. Firstly, if you can purchase raclette cheese (available at many grocers with a good cheese selection) that is ideal, however many cheeses will work in this situation as long as they melt well and aren’t overly strong. I often save time by boiling my potatoes at home (choose waxy varieties such as Yukon gold). A wood fire imparts a nice smokiness to the cheese, so you may be able to place your large piece of cheese on slab of wood or bark covered with aluminum foil and put it next to the fire (or open the door of the woodstove if you are staying in a hut). Cooking on open fire is tricky and requires constant attention. A simpler method is to make a gratin of sorts by slicing your cooked potatoes into a pan and covering with slices of cheese and a touch of water (or wine), cover and heat until the cheese melts. Slice up a good saucisson sec (or a salami or ham) and have it at. I count 3-4 medium sized potatoes, plus about ½ pound of cheese, and 4-5 oz of cured meats per person. Cheese and potatoes will satiate that ski-touring hunger perfectly. Meat- I am a huge fan of sausages. They are economical, flavorful, have no waste (like bones), thaw and freeze well (because of the salt and fat content), are easy to prepare and come in a slew of flavors. Bratwurst, hot Italian, Diots (the local pork sausage in Haute Savoie France that I love), kielbasa, and bangers as well as tons of poultry based sausages are widely available. I often pack my sausages frozen (in a vacuum pack) and cook them in a pan (still frozen) by adding a little water and covering. Once they are thawed and hot I boil or pour off the water and brown them. Depending on what country your sausage’s country of origin you can pair them with sauerkraut, peppers and onions, potatoes, polenta, rice and beans, or just eat them on bread. For easy cleanup campfire cooking, impale them on stick. Don’t forget a good starch to go along and maybe some spicy mustard. Beef ribeye steaks over a wood fire are also tasty. Photo by Aaron Schorsch. Wild meats- In Northern Sweden we ate tons of reindeer and moose meat, both of which were readily available, lean, delicious and tasted of the North. Perhaps you are a hunter and have access to elk or deer meat, or moose?. 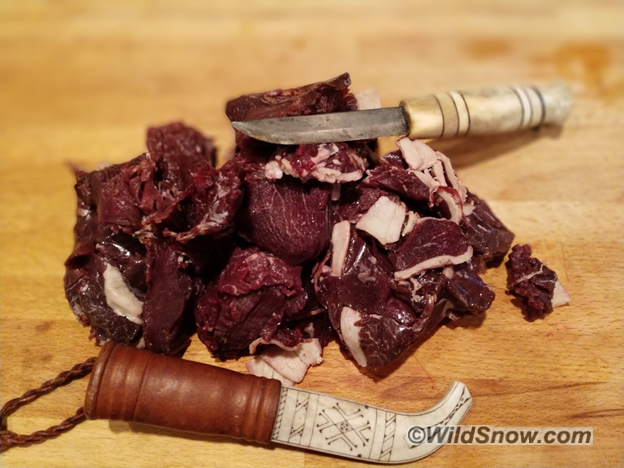 In Swedish Lapland “Souvas” (salted and cold smoked reindeer meat, usually from the leg) is very popular as it travels well, tastes great, and will flavor whatever you are cooking. If taking on the task of salting overnight and then cold-smoking over a birch fire for 8 hours seems ambitious to you, let me recommend simply marinating a cut that responds well to dry heat (such as from the leg or loin). I like a simple marinade of red wine, garlic, salt, a little oil, and bay leaf, but you can use whatever you like. Season the meat again with salt before cooking and grill or fry in butter or oil to your desired degree of done-ness. If you are feeling adventurous and have built a fire, wait for the coals to form a thin layer of white ash. Crazy as this sounds place the meat DIRECTLY on the coals. That’s right throw the meat on the fire (make sure you have a way to retrieve it). The coals will sear the meat and at first they will stick. As the meat forms a nice crust the coals should release and you can flip them (I make tongs by bending a finger sized green branch in two). Cook until the meat releases on the other side, remove from the fire, let rest a bit, and enjoy. This technique is rather surprising but makes for delicious, smokey meat with no cleanup and without having to bring a pan! Plus you will impress your friends…or more firmly affirm to them that you are caveman or woman). Souvas-Salted and cold-smoked reindeer meat. Photo by Aaron Schorsch. I ski tour on tech bindings because I love their elegance and substantial weight savings. While some people prefer to use that weight savings to achieve more vertical, I usually use it to bring more food! Thus my recommendation: next time you go out for a ski tour consider savoring your time in nature with an outdoor meal or just a hot cuppa and a cookie. Bon appétit! As enjoying something more than trail mix for backcountry food might involve taking time out from uphill heat production, a few basic warmth tips for newcomers to human powered winter sport: Ski touring is sweaty work and while we may be overheated when we first stop, we can chill quickly due to our damp clothes (despite the care one should take with layering). Wearing a technical fabric (wool or synthetic, no cotton) next to the skin is thus recommended. I always have a down or synthetic jacket with me that I throw on shortly after I stop (it is much easier to conserve the heat you have worked up that to make it later when you are cold). Some people prefer to bring a heavy down or synthetic insulation vest (this is particularly good for very cold places) so that they can wear it over their ski jacket and not lose heat taking their ski jacket on and off. Also, avoid sitting directly in the snow or on a cold rock. We lose heat quickly through touching cold objects so use a closed cell foam mat, backpack, or some other insulating material for your derriere. Caption That Photo — We have a winner! Role Models, Athletic Drinks, Etc. Makes me salivate just thinking about salami or some of that cold smoked reindeer right now. I’m sorry to criticize, but “good old peanuts and raisins”?!? GOPR? Any outdoorsperson would know it’s called gorp. All the rest of the article I agree with, except such salty foods for dinner. I get so thirsty when I eat a lot of salt. I hate waking up, drinking water, and having to get out of my warm sleeping bag to pee out the previous hydration. That said, it’s tough to beat a raclette dinner. Not sure meat is good. The body waste energy to break down any processed food, especially meats, Pure grains, nuts and frui break down easily and efficiently and provided everything you need. Beef jerky might taste good for the mind, but the body waste time and energy breaking it down to some piddly useful amount while the rest is simply waste. I tend to east as much unprocessed food as possible but don’t mind a boost from energy drink and gu-s. I just think any processed foods diminish performance. Save the chips, cheeses and baloney for home. Miso soup in the thermos has been my go to and has been incredibly popular with everyone who I share it with. First discovered in the tea/hot chocolate/instant coffee bag on a hot trip in NZ as enjoyed after we came in for the day. It’s rare too not have a thermos full of miso on any outing these days. Don’t underestimate warm or cold Tang either. Good enough for astronauts, good enough for outdoors people. Way to keep the touring in ski touring! I enjoy seeing this aspect of ski touring emphasized – of enjoying one’s presence in the outdoors, rather than the competitive aspect of seeing who can rack up the most vert, or stomp the biggest cliff. I’ve spent quite a bit of time thinking about how to make my ski touring meals more enjoyable, and this article gives lots of inspiration! Love this! As a former pro cyclist who now slings cheese and charcuterie at Cured in Boulder, we even offer a few boxes and picnics designed upon what we throw in our own packs. Aaron, we should go ski-eating some time:). Shameless plug, but love seein got hers share the same passion for play and good food, not just energy bars and gels! My friends got me into wholewheat tortilla wraps. These can be stowed flat in your pack and if you bring some sliced meat and a small bag of fresh salad you can have a proper lunch that won’t be very messy. Bread is just not practical. For faster tours where I need carbohydrates, I love to make Churchkhela’s. They are a dried grapejuice and nuts snack that you can make at home, and it’s the best thing ever. Not as sweet as a powerbar, but plenty of energy in them. You can store them for months, so make a lot. If I wasn’t a weight weenie, I’d bring pølser (small sausages) in my special wideneck thermos on skitours like they do in Norway. It’s pretty fun to pull this out of your backpack after a long climb and enjoy some hotdogs with friends on the top of a mountain. Great tips on the tongs! I’ve transitioned towards more balance during the day–used to just load carbs. Cheese and meat can be hard to digest in the middle of high output activities, so a little goes a long way. Do I remember correctly that fats at night (cheese and meat) will keep you warmer? 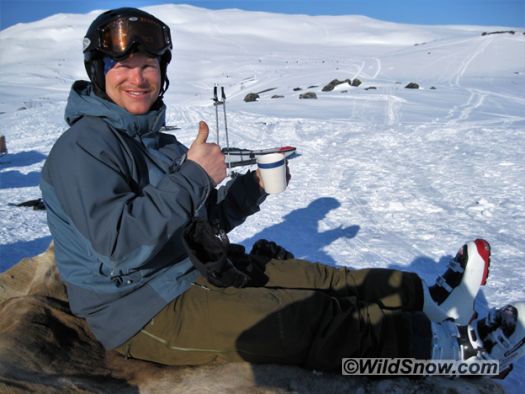 I am happy to see that there are other ski tourerers who enjoy good food in the outdoors! Landjaeger (smallish German dried sausages) are also a great choice and extra convenient because you can usually just bite off pieces rather than having to slice them. Miso soup in a thermos sounds like a great idea and is super easy and a hot, salty soup would be right up my alley! Will can you post a recipe for Churhkelas? I’ve got a suggestion for those miso soup drinkers; add nuts. My wife started throwing a handful of mixed nut into her cup and I quickly followed. Adds a nice crunchy bit of extra energy to the already good miso. And also if you’re having a backcountry raclette, remember to have lots of water around to drink. All that salty cheese never fails to bring on a huge thirst in the middle of the night. @ Will I will happily go “ski-eating” with you some time! I will be leading a “Ski trip with a Cheese problem” to the French and Swiss Alps in March that will include a lot of both skiing and eating (also plenty of wine). Also I love the “Opinel” French knife in Cured’s “European Vacation” box. Opinels are sharp, lightweight, locking, inexpensive, and perfect for slicing up charcuterie, cheese, and bread. The carbs only sports diet is a bit dated, i am a big fan of the Zone diet and there are other high protein options out there… Chris Froome himself is into this type of diet. “nutritional” guidelines would help us all improve our cardio. But +1 to high fat, low carb for training. Crazy results, lose weight, much faster and rarely feel hungry. Fasted training, ftw. Thank you Marc for that article on Chris Froome’s diet. As an ultimate frisbee player who plays all day tournaments with little break for food I have always found that a hearty breakfast with a good bit of protein (big fan of eggs) gives me more lasting energy for a day of high output exercise. When I am spending time in Swedish Lapland with friends they typically consume large quantities of meat (reindeer meat) while skiing or hiking large distances (Check out the world’s longest classical cross-country ski race history https://www.redbullnordenskioldsloppet.se/en/history/). Of course this is anecdotal evidence for the consumption of protein, and the Swedes and Sami I know tend to be pretty hearty folk, but I am keeping the meat and cheese in my pack! I can personally attest to Aaron’s love of good hearty food, cheese and wine. My wife and I and some friends participated in Aaron’s “Ski trip with a Cheese problem” last March 2018. He introduced us to “Fondue au Fromage” (rustic bread dipped into a simmering pot of melted mountain cheeses and wine), “Raclette” (slices of creamy melting cheese poured over boiled potatoes and eaten with cured meats), “Tartiflette” (a gratin of potatoes, lardons, and onions covered with a slightly aged soft cheese called Reblochon) and most importantly Fromage Blanc. These hearty meals fueled us for the long days on the mountain. As a morning cyclist during the warm weather months and uphill skier during the winter, I am a big fan of a hearty protein filled breakfast with plenty of coffee and water. Although, I have been know to partake in the occasional gel, a lot of times there is nothing better than a peanut butter sandwich to keep you going. “Powered by Tartiflette” is a bumper sticker I sometimes see in the French Alps. In the interest of science I think we should run an experiment with 1 group of skiers eating cheese and cured meat based dishes such as fondue, raclette, and tartiflette with wine for dinner while another group eats gels, powerbars, and energy drinks. Then we can measure a variety of performance benchmarks on the skin track and on the way down. For anyone who wants to join the “cheese skiers” I will be leading a group in the French Alps March 8-16!